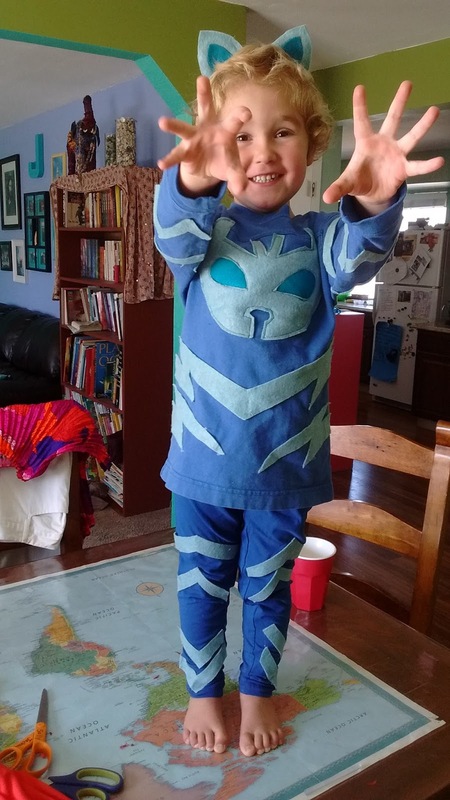 This was a really easy costume to make for a toddler. If he was a little older and wearing this to school, I probably would've put more time and effort into the details, but I didn't feel it was necessary for a tiny toddler costume. This costume cost me $7 to make and countless hours of happiness coming from my Catboy loving three year old! It's pretty self explanatory but I just basically cut out the various "lightening bolt" shapes and hot glued them onto the clothing. 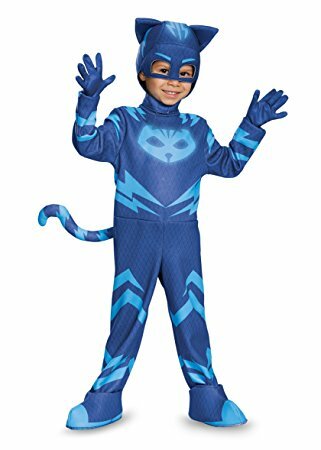 I followed the patterns on the actual Catboy costume photo ($20 from Amazon). I sewed the cat-head onto the shirt because it was bigger and easier to sew on. I also sewed 3-4 small stitches onto the lightening bolts on various points to hold them into place in case the glue gave way. Lastly, I got a headband from the Dollar Store and hot glued cat ears onto it. I've seen other Catboy costumes with masks, but I knew my toddler wouldn't last a second wearing a mask over his face, so I went with a headband. It's perfect and he loves it! I love making costumes like this--easy, inexpensive, and brings so much Halloween joy to my boy!